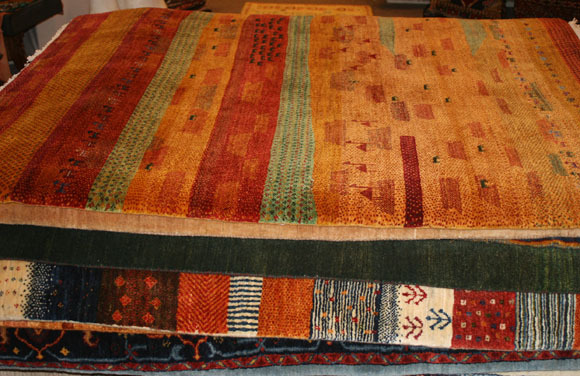 When you walk through the front door of our shop, we hope you enjoy the burst of color from rugs and textiles, which is like music for your eyes. Our building used to be the Jones Department Store, so it has lots of small rooms and unusual areas. We turned the dressing rooms and clothes closets into little spaces for displaying certain kinds of treasures. After we returned from Tibet, Nepal and Dharamsala in India, we set up a special Tibetan section, where you can find prayer flags, singing bowls, jewelry and other artifacts. 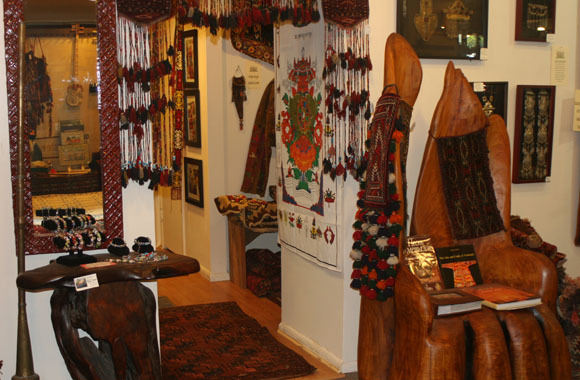 Sharon lived in Bishkek for two years, so don’t miss the little Kyrgyz section. You can see antique bellows, tall reed screens leather pants and even an exquisite old scissors holder. Now that our collection of beads is rapidly expanding, you can find several sections of unusual semi-precious stones, as well as great bargains in unusual pendants. The jewelry just won’t be contained in any one part of the the store. Earring stands have proliferated, so they now live everywhere. We have also expanded the bargain area. As you enter, you will see a few tables with $ 7.00 earrings, $ 10.00 rings and other good prices. In addition, we created a “bargain room” at the foot of the stairs in the back. If something doesn’t sell and we need the space, it moves to the bargain area for 50 percent of the original price.